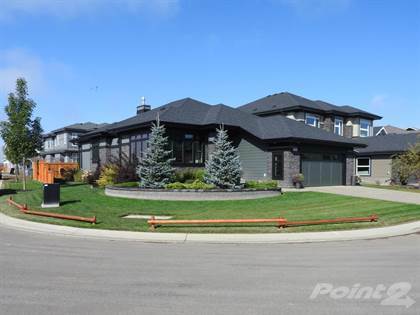 Contemporary by Design in Jagare Ridge Golf Course, this Custom Built Executive Bungalow by Kimberley Homes is incredible, offering 1610 sqft on the main + Finished Basement. With all the upgrades that you would expect, this 3 bedroom (or 2 + Den), 2.5 Bathrooms bungalow is perfect for the executive couple or those who are downsizing. Wall to wall dark Canadian maple hardwood flooring throughout the main floor (including the stairs to the basement), as well ceramics in the master ensuite & laundry area. This open design features 9.5’ ceilings, pot lights thru-out, Linear gas fireplace in the great room, an ultra-modern Transitional Shaker Kitchen with soft closing cabinets, Quartz counters, JennAir built-in appliances. The finished basement offers a recreation room with optional pool table, designer Wine Cellar, 3rd. bedroom & 4 piece bathroom. Other features include; Central Vacuum system, Central AC, Soft Water system & Security system, Professionally Landscaping with Underground Irrigation System, Circular Retaining Wall and Sculptured Raised shrub beds with over 40 shrubs & 5 Blue Spruce trees as well fenced on 2 sides. The 23x24 oversized garage is fully finished insulated & heated. This Exclusive Listing is presented in the Prestigious Neighborhood of Jagare Ridge Golf Course, SW Edmonton. Please - Serious Buyers Only. Hi, I'd like to find out more information about 1132 Hainstock Green SW. Thanks so much!